Post weights used per round. Stay flexible with the number of Aussies you do today. It's just a warm up. If you typically get sore arms from these, stay below 50 total. Less if you're new. Take plenty of rest between warm-up sets. 90-120 seconds suggested. Take no rests between rounds of the workout. It'll be interesting to see the difference between the weights posted for set #1 vs. set #5. Remember this suggestion? "It'll be interesting to see the difference in weights posted between this workout and the NEXT time we do this one, which is the point." Having a hard time doing those pushups (daily extras) using STRICT form? Try one knee pushups. I like to brace myself on a bench with one hand while I do bent rows with the other hand. That'll help those of you who's backs feel a little smoked from yesterday's bent rows. 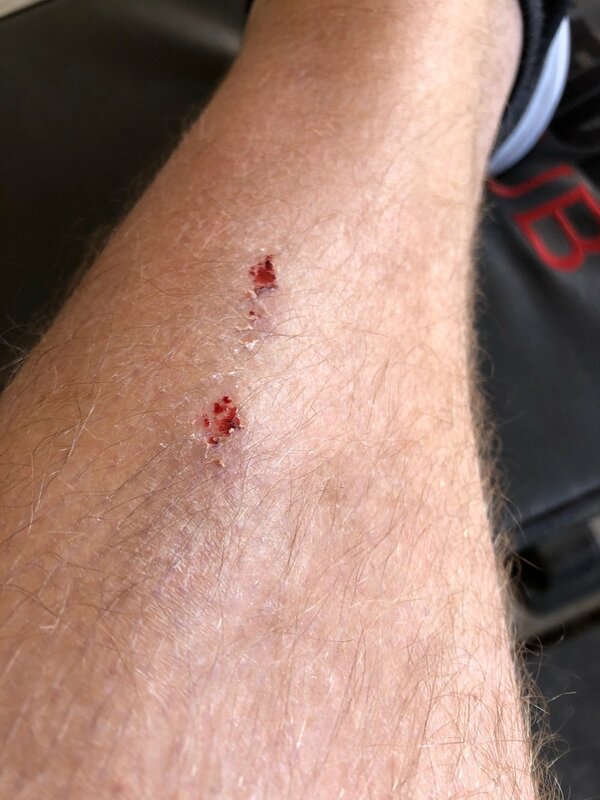 I've always thought if you walk away from dead lift day with bloody shins, you did it RIGHT! Thx for the pic Jesse!